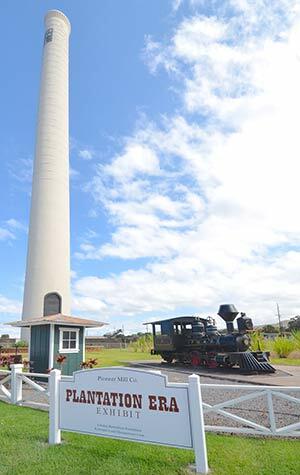 The Pioneer Mill Co. Smokestack, an important landmark in Lahaina, has been preserved and the area surrounding it has been beautified with landscaping, a boardwalk and signage. In 2010, Lahaina Restoration Foundation completed the much-anticipated restoration of the smokestack and replaced its crown, which was removed several years ago for safety reasons. The four-month restoration of the smokestack included the installation of 17 carbon steel tension bands, a steel door over the flue duct breeching, repair of the exterior concrete and waterproof coating of the entire exterior capped by a 14-foot tall carbon steel “crown” at the top. Aside from the structure, the renovation also included a display of interpretive plaques, landscape features and a circular commemorative brick walkway around the base of the smokestack. The newly restored “Lahaina” and “Launiupoko” locomotives that were original Pioneer Mill sugar cane trains were installed along with old mill machines and field equipment, resulting in a new Plantation Era Exhibit. This outdoor exhibit is open daily between dawn and dusk. Free parking is available in the lot between 275 and 277 Lahainaluna Road. Personalized bricks are available for purchase and can be engraved with your name, the name of a loved one, your company name or logo. Please click on the “Form” button below to download and print a Brick Order Form, or complete the online form below with your engraving message and submit. By purchasing a brick, you’re preserving a slice of history and creating a permanent legacy of your support for Lahaina’s past. 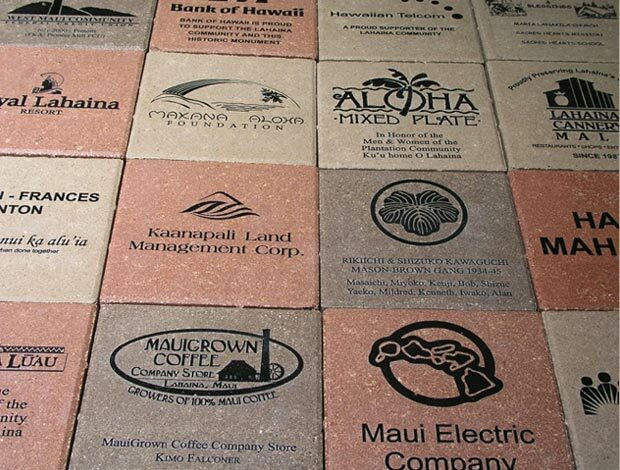 Buy a brick to show your pride in Lahaina, your connection to the mill, or to memorialize a loved one. It will be installed on the walkway encircling the smokestack. Your tax deductible contribution will ensure that the history of Lahaina’s Plantation Era will be preserved for you, your children and future generations. If you have purchased a brick above, the next step is to fill out this form with the text you would like to appear on your brick. from one of the options listed below. Please note that each line is limited to 25 letters and spaces. The engraver will automatically center each line of the message and use upper and lowercase lettering. Indicate if this person was an employee of Pioneer Mill Co.
We thank you for taking the time to fill out this online form for the text of your brick. If you have purchased Brick Option #3, please also be sure to upload your logo.